This article analyzes the indicators comprising the Conference Board’s Lagging, Coincident and Leading Economic Indexes. Each indicator is analyzed individually, scored -1, 0, or +1 for mostly negative, neutral, or mostly positive, and then averaged into Lagging, Coincident and Leading diffusion indexes scaled from -100% (economic free fall) to +100% (robust expansion). Here’s the upshot of the article: The first graph below depicts the equally-weighted diffusion indexes. The Lagging indicator score of +14% corroborates that the US economy was experiencing painfully slow growth during most of 2011. 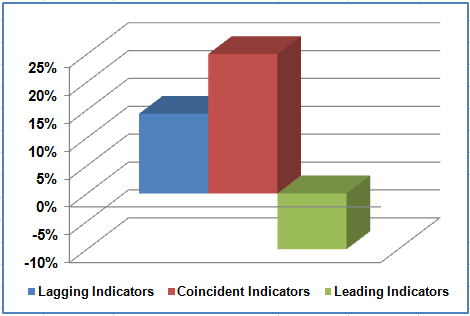 The Coincident indicator score of +25% suggests improving business conditions and accelerating growth late in 2011. The Leading indicator score of -10% suggests that the recent improvement in business conditions will not accelerate further, and the slow-growth environment will persist through the first half of 2012, at least. If the indexes are calculated using the Conference Board’s weights, the results are similar, as shown in the graph below. The Lagging, Coincident and Leading scores equal +11%, +16%, and -11%, respectively. Conclusion: The Conference Board’s Economic Indicators confirm that the US economy grew slowly in 2011. Conditions for growth improved slightly in the 4th quarter. Growth is not expected to accelerate for the first half of 2012, however, and may slow further. The US economy remains vulnerable to the forces that may have already tipped Europe into a recession. Average Bank Prime Rate (28.1%). Real Total Business Loans are also depicted (red line). A rising average prime rate indicates increasing demand for credit, as banks mark up the price of interest. 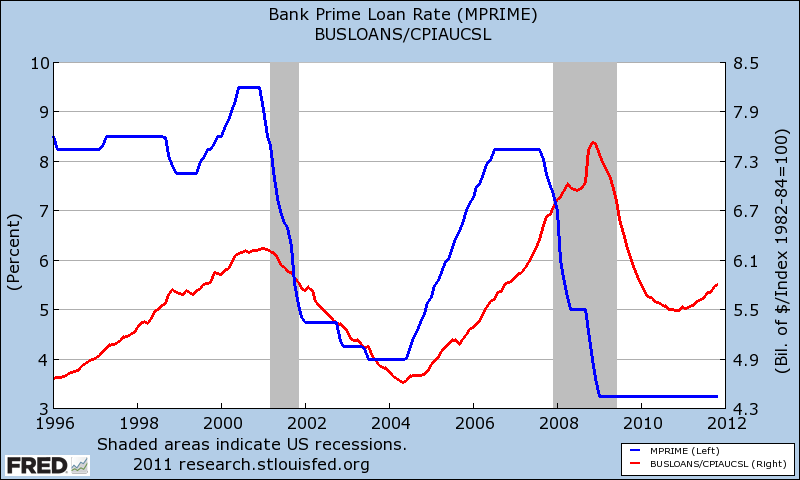 Thus far the prime rate has failed to turn upwards in sync with business borrowing as it did in 2004. Score this indicator -1, as it fails to corroborate the 2011 economic expansion. 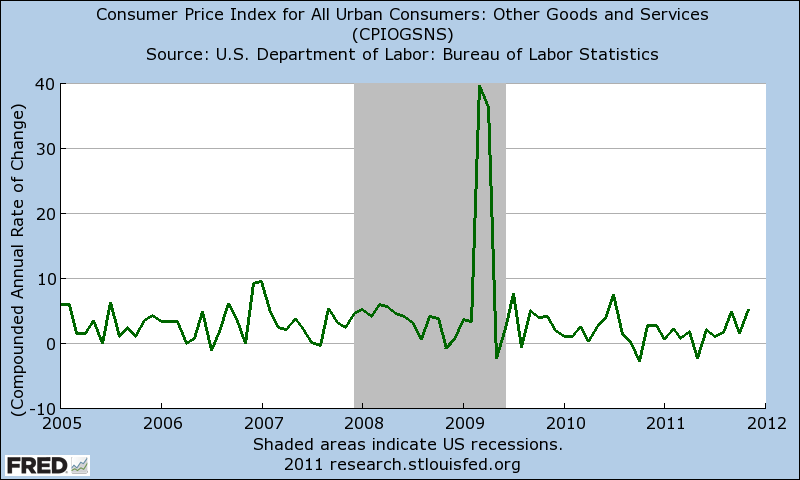 Consumer Price Index for Services (19.1%). This indicator peaks midway during a recession. 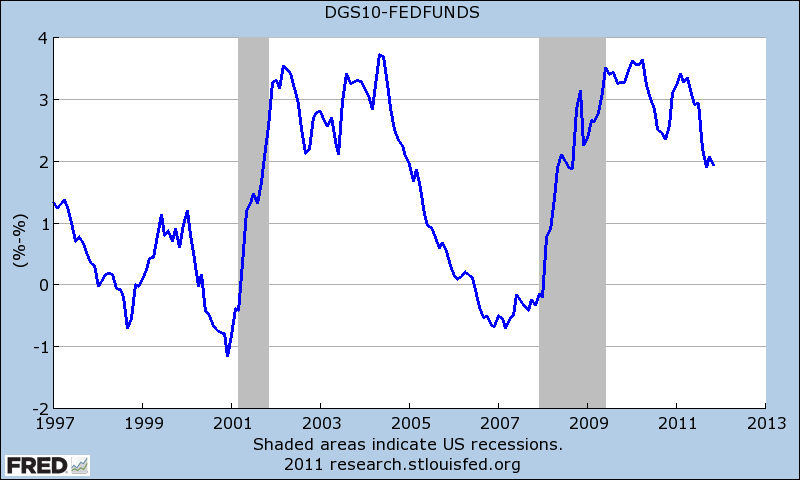 It has displayed no meaningful trend since 2009. Score this indicator zero for neutral. 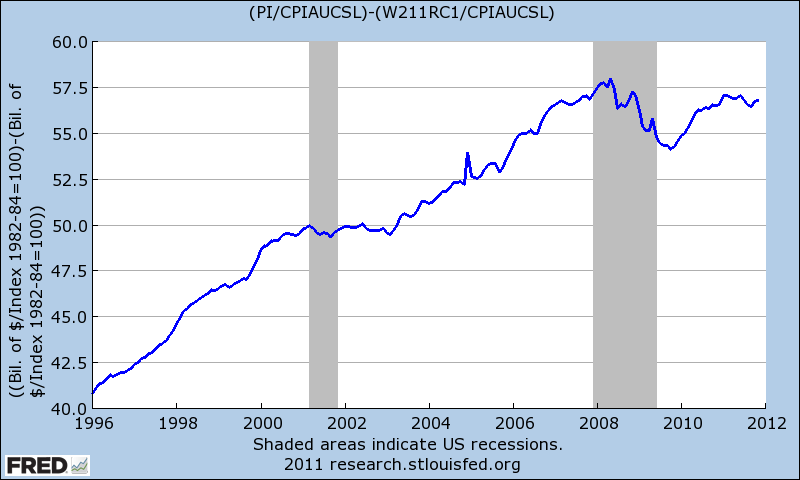 Ratio of Consumer Credit to Personal Income (18.9%). 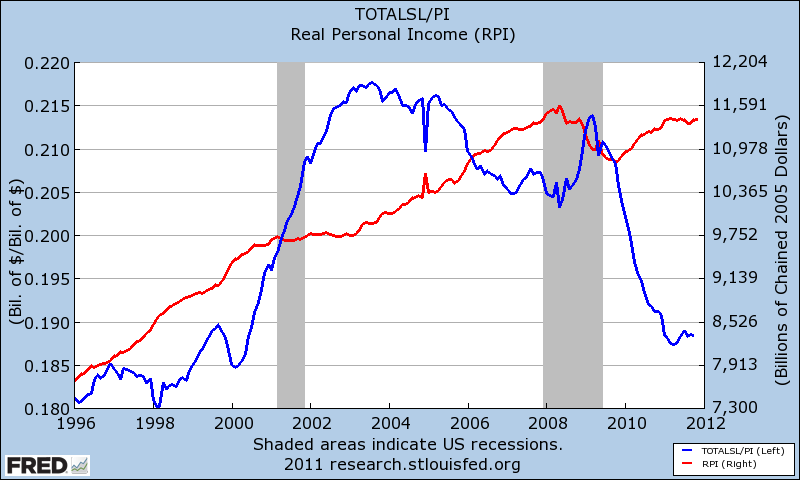 Real Personal Income is also depicted (red line). Consumer Credit/Personal Income is expected to display a trough several months after Real Personal Income begins rising, which is exactly what the indicator shows for late 2011. Score this indicator +1. 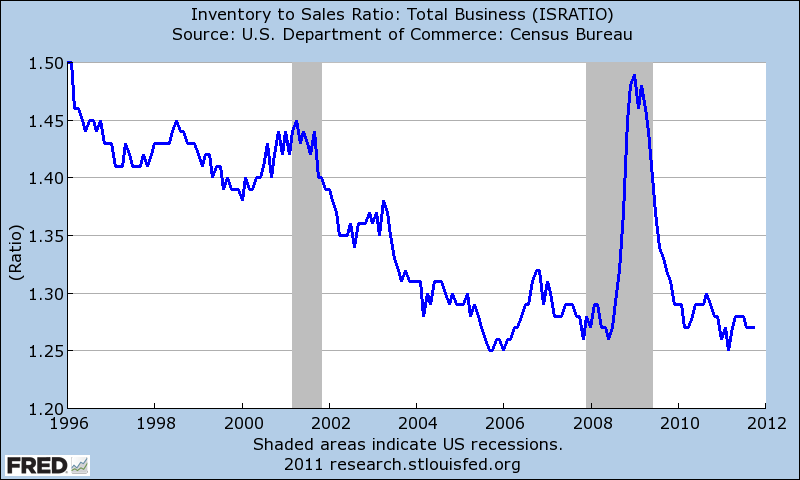 Inventory to Sales Ratio, Manufacturing and Trade (12.6%). 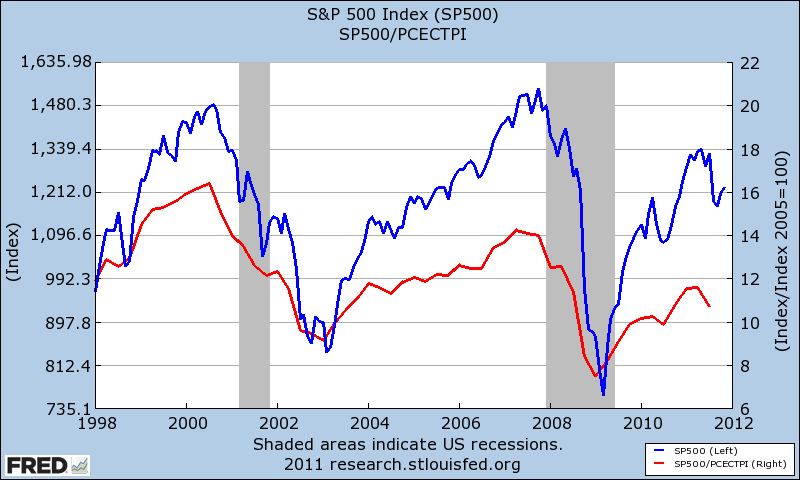 This indicator rises during recessions as inventories accumulate, and declines during expansions. The indicator trended downwards in 2011, thus earning a score of +1. 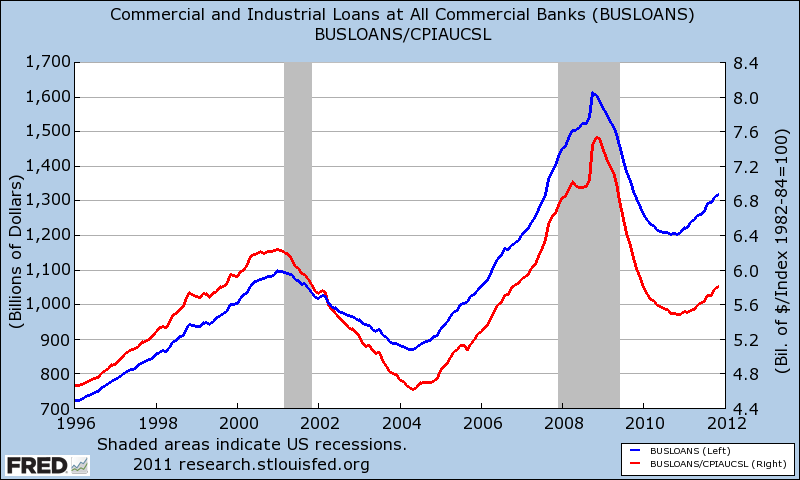 Commercial and Industrial Loans (11.1%). Both the nominal and real series are displayed. Both series display a significant uptrend, confirming economic expansion as they did in 2004-2005. Score this indicator +1. 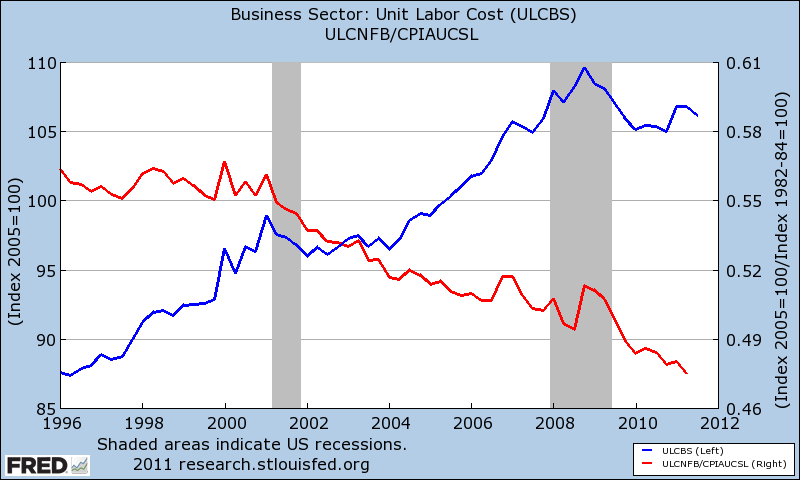 Unit Labor Cost, Manufacturing (6.2%). Both the nominal and real series are displayed. Unit Labor Costs are expected to peak midway through a recession, which occurred in 2009. But Real Unit Labor Costs have been in a downtrend for 15 years, which may be good for business, but bad for the working class. Score this indicator zero for a mixed or neutral reading. 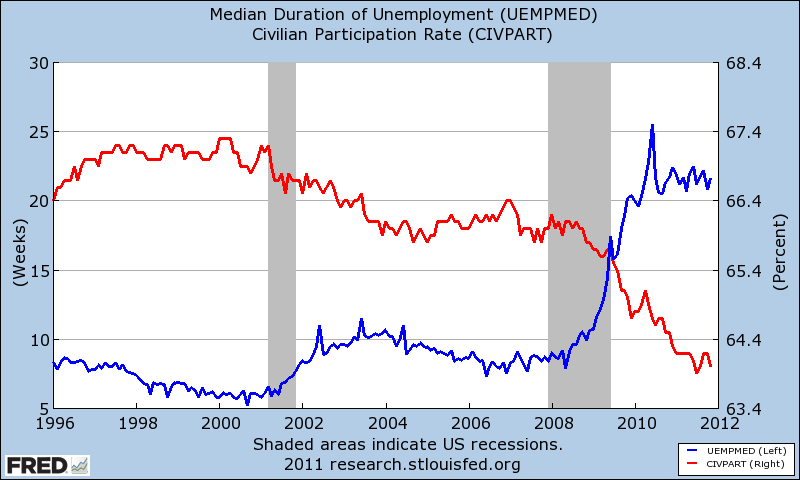 Median Duration of Unemployment (3.7%). The Labor Force Participation Rate is also shown. Unemployment Duration is expected to gradually decline as an expansion picks up steam. All official unemployment series get an unnatural boost from not counting the underemployed and discouraged labor force dropouts, however. The staggeringly high median duration of 22 weeks merits a score of -1. It is worth noting that the series took a long time to begin trending downward following the last recession, however, so improvements in this series may be forthcoming. 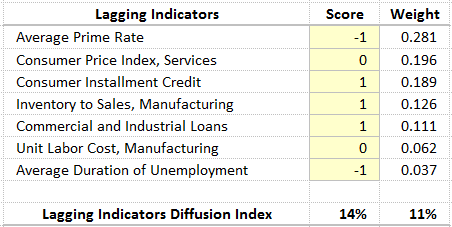 The summary table of Lagging Indicators is shown below. The equally-weighted and Conference Board-weighted scores of +14% and +11% confirm that the US economy experienced growth in 2011, but this growth was painfully slow. Employees on Nonagricultural Payrolls (54.1%). 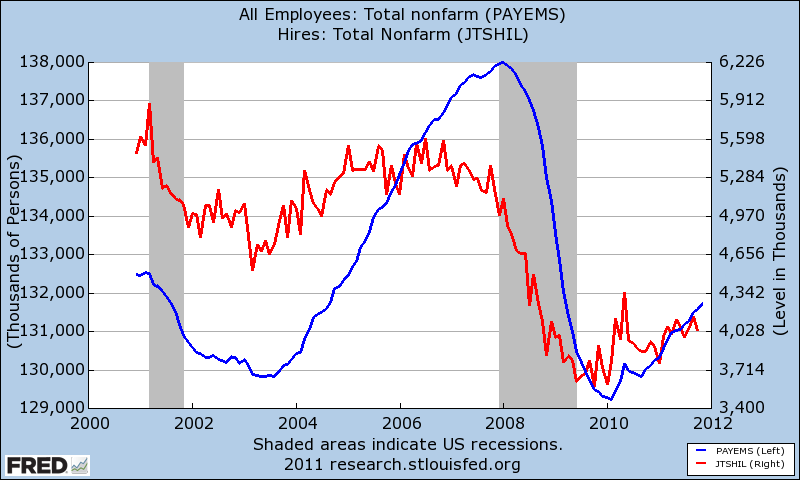 Total Nonfarm Payrolls (blue) and Total Nonfarm Hiring (red) are shown below. While both series have indeed turned upward, the US employs the same number of workers as it did in 2001, and is adding new workers at an almost ridiculously slow pace. Score this indicator zero for neutral, as the positive percentage changes are offset by the low level of the series. Personal Income Less Transfer Payments (19.1%). Real Personal Income Less Real Transfer Payments is shown below. (A more granular view appears in the 2nd graph.) The series has bottomed, but the trend is flat, rather than rising. 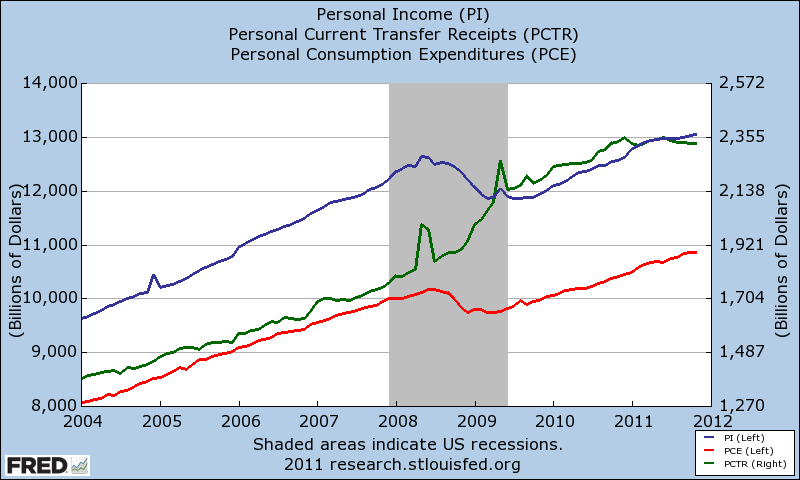 Personal Income, Personal Consumption, and Transfer Payments (green) are depicted below. Total Transfer Payments fueled much of the rise in Personal Income over the past 2 years. With Transfer Payments leveling off (and predicted to decline in 2012), growth in Real Personal Income will most likely stagnate for a while. This indicator is right on the border, but the trend is up so I will score it +1. 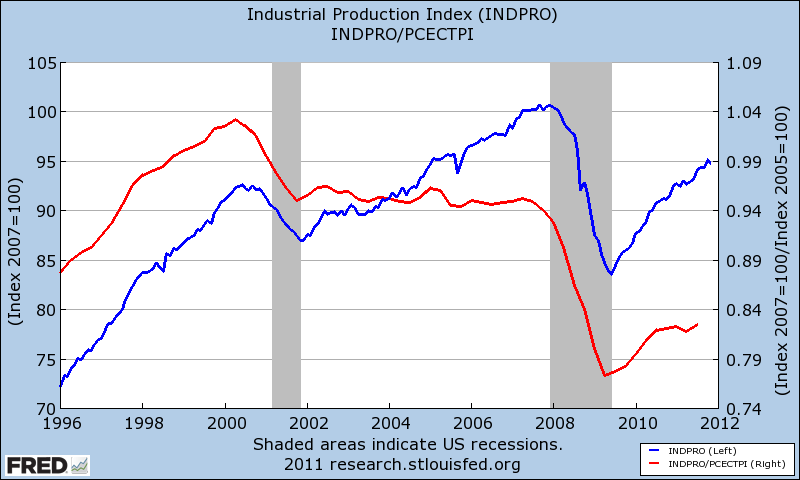 Industrial Production (14.9%). The Nominal and Real series are shown. Nominal Industrial Production displays a promising rebound, but when adjusted for inflation, the long-term downtrend in the series is more evident. Score this series -1, as it bespeaks an economy in a long-term decline. Real Manufacturing and Trade Sales (11.9%). 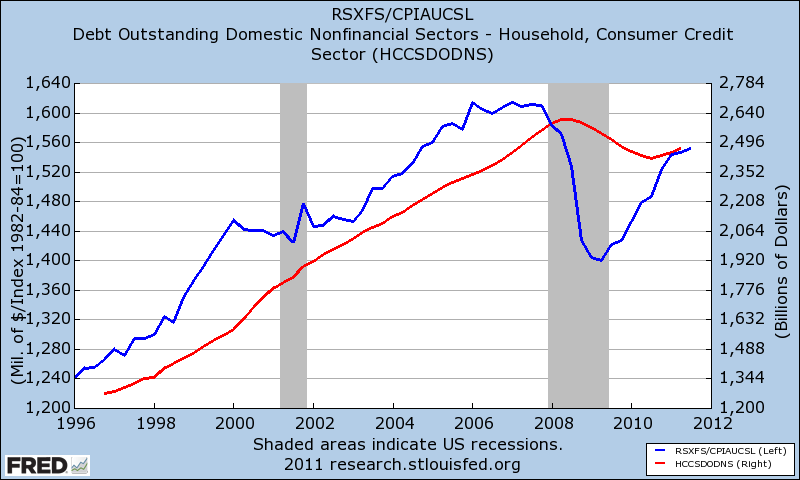 Total Household Debt is also shown (as much of the sales growth from the past decade was fueled by debt). The series shows a smart rebound, and merits a score of +1. 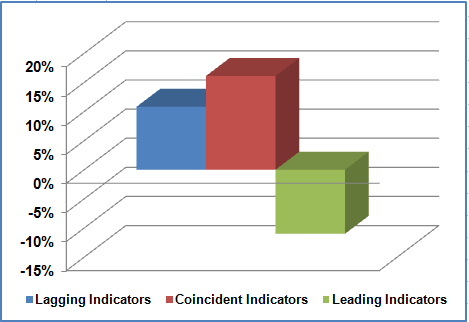 The scores of the four Coincident Indicators are shown below. The diffusion scores are 25% (equally-weighted) and 16% (Conference Board weights), respectively, slightly higher than the Lagging Indicator scores. 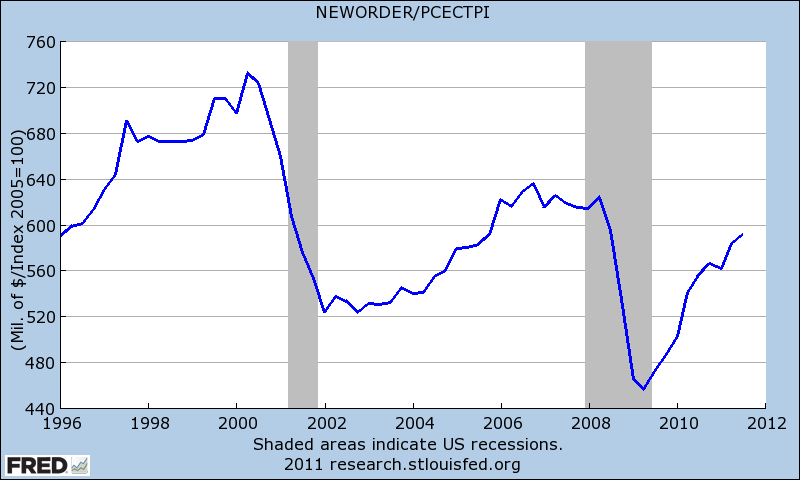 This suggests modest improvements in business conditions and economic growth in late 2011. Real M2 Money Supply (35.5%). 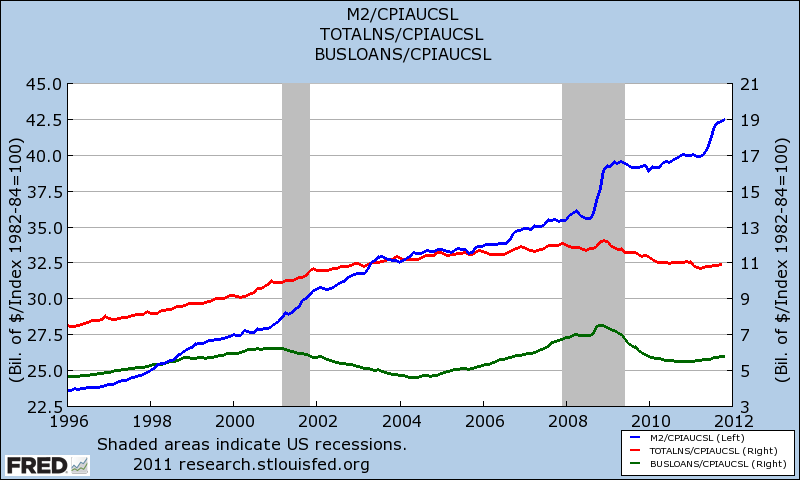 Real M2 is depicted below, along with Real Consumer and Business Loans. 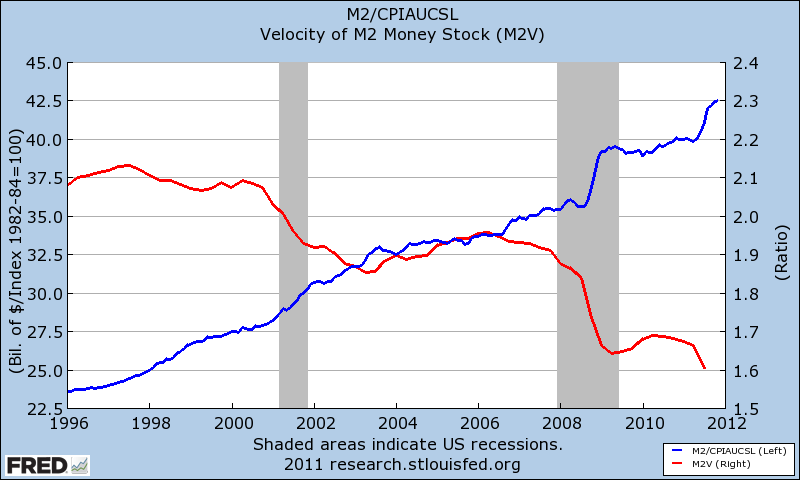 The 2nd graph charts Real M2 with the Velocity of M2. The Real M2 Leading Indicator reveals some of the weaknesses in the Conference Board system, which scores series based on their percentage changes. Real M2 is definitely rising, but not due to market forces (strong demand for credit or liquidity) — it’s mainly driven by Federal Reserve intervention (manipulation?). Neither total borrowing nor velocity (shown below) is rising. Score this indicator zero — M2 is rising, but the damage from the Fed’s loose money policies will most likely plague us for a generation (see the inflation statistics below). Average Length of the Manufacturing Workweek (25.5%). 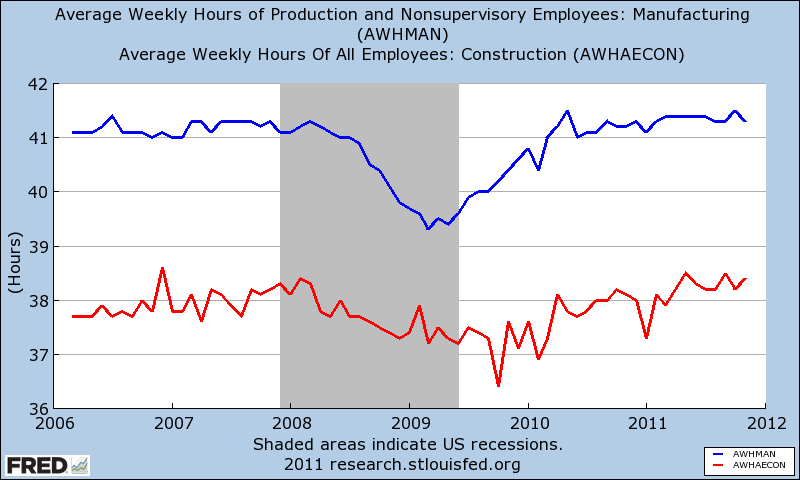 The average length of the Construction Workweek is also depicted. This is another Conference Board indicator that looks good on the surface, as the Manufacturing Workweek has rebounded to its pre-recession levels. With a bit more context, the apparently positive signal looks somewhat different, however. 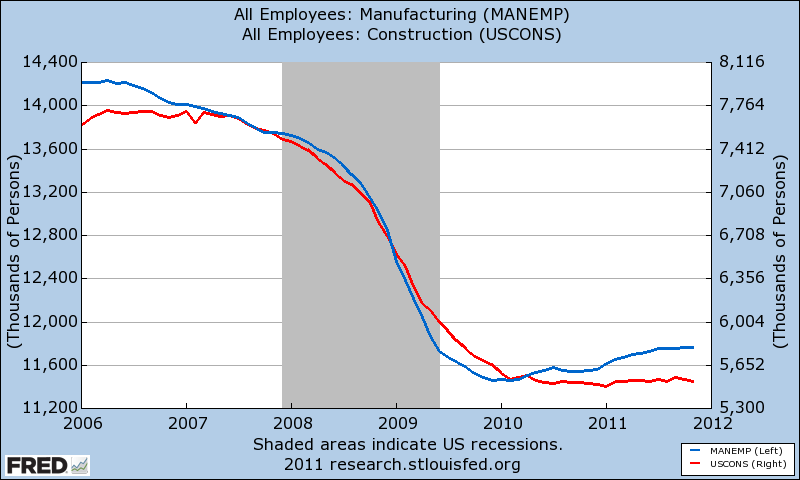 Consider Total Employment in Manufacturing and Construction, depicted in the graph below. The length of the respective workweeks was restored at the cost of permanently eliminating 5 million high-paying middle- and working-class jobs. Score this indicator zero, as the rising workweek is offset by signs of a dramatically contracting labor market. Interest Rate Spread, 10-Year Yield Minus Fed Funds (10.2%). The yield on the 10-year T-note minus the Fed Funds rate is really a proxy for the slope of the yield curve, depicted in the 2nd graph below. 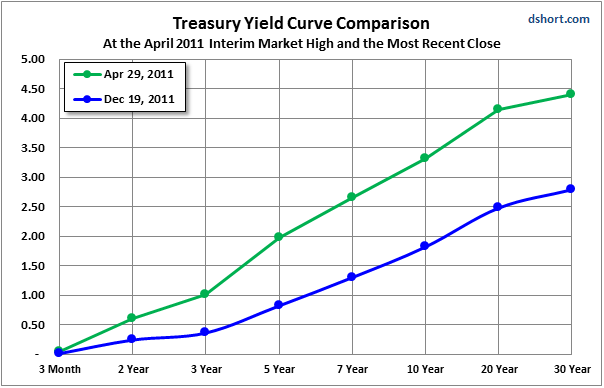 The Yield Curve flattened considerably in 2011. A flattening Yield Curve suggests economic slowdown, so score this indicator -1. Manufacturers’ New Orders, Consumer Goods and Materials (7.7%). 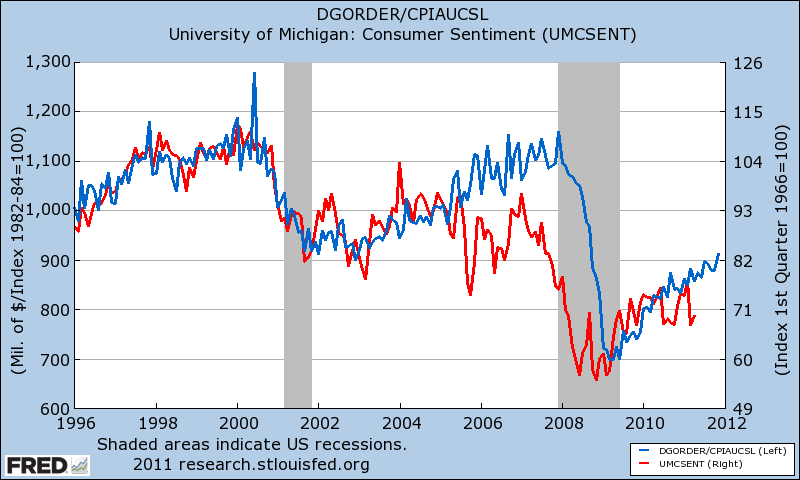 Real Durable Goods is depicted along with Consumer Sentiment (the strong positive correlation is evident). This is a tough one to score — Real New Orders are rising following the last recession, but the inflation-adjusted series achieves lower highs following each of the last two recessions. I had to inject a bit of subjective optimism to score this indicator +1. 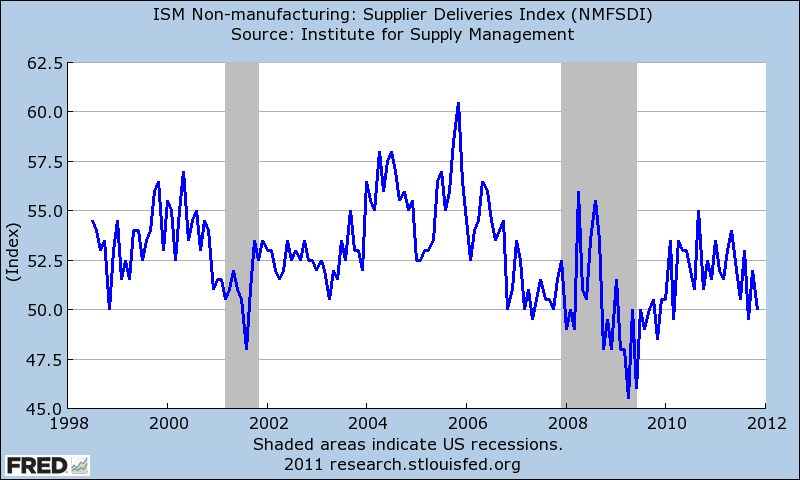 Suppliers Delivery Index (6.7%). This index is trending downward for most of 2011, thus meriting a score of -1. Stock Prices, S&P 500 (3.9%). The Real and Nominal S&P 500 is shown below. The long-term market trend looks flat in nominal terms, but registers as a secular bear market in real terms. 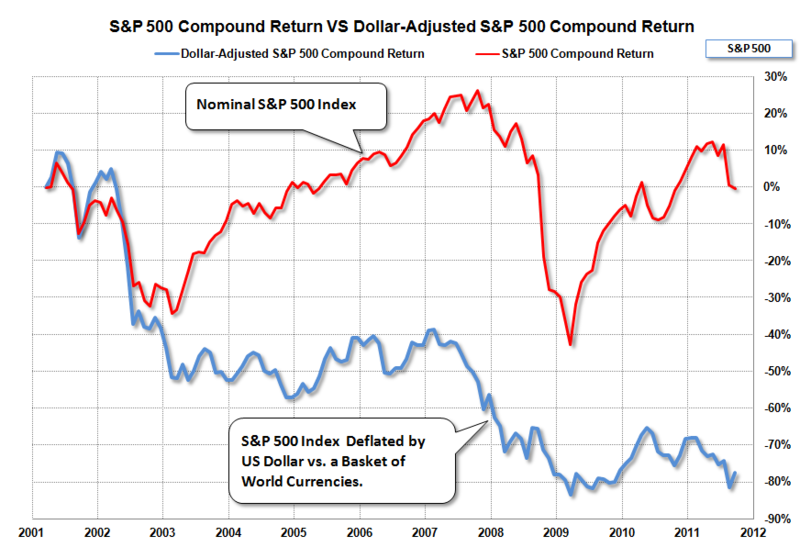 If you’re still not convinced, consider the S&P 500 Total Return since 2001 deflated by the value of the US Dollar. The dramatic loss of purchasing power for buy-and-hold investors is clearly evident. This series earns a score of -1. The secular bear market in stocks continues. 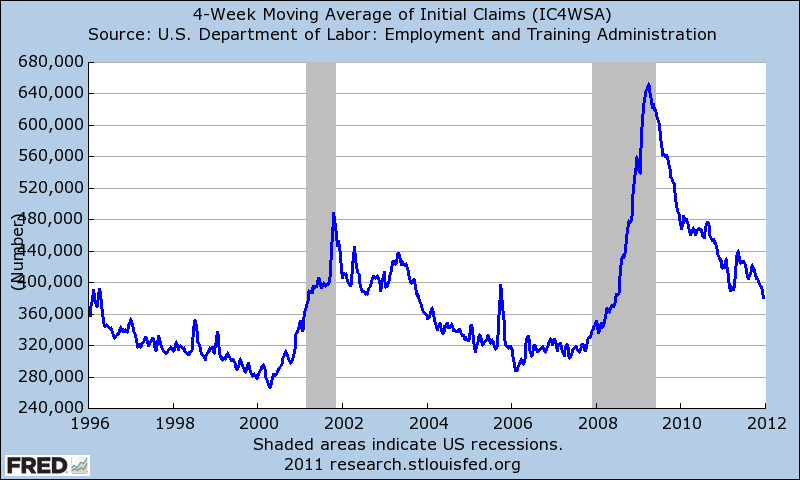 Average Weekly Claims for Unemployment Insurance (3.1%). Unemployment is deliberately measured with a positive bias, as workers too discouraged to keep looking are no longer counted. Nonetheless, the series is trending downward, and merits a score of +1. Index of Consumer Expectations (2.8%). This series displays a sideways trend around a scarily low level, which justifies no more than a score of zero. 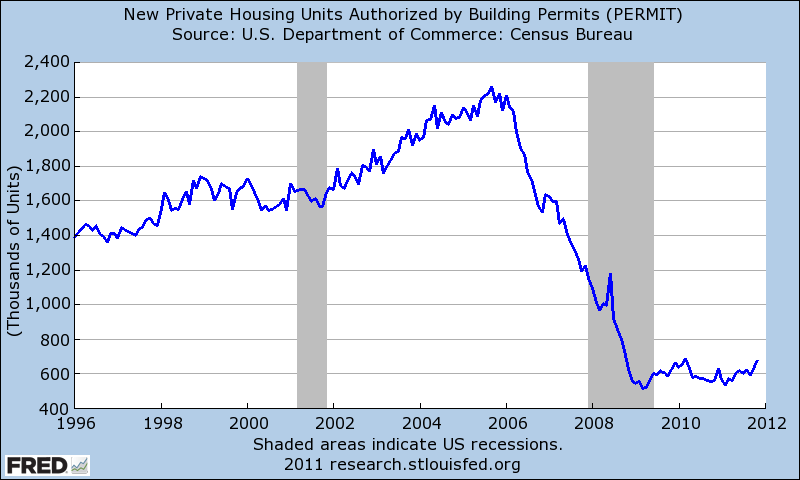 Building Permits, New Private Housing Units (2.7%). This series looks like the backdrop graph in a Dilbert comic strip. Too bad the process doesn’t allow me to score it less than -1. Manufacturers’ New Orders, Nondefense Capital Goods (1.9%). Real Nondefense Capital Goods orders are shown below. The series is rising strongly, so I will score it +1, but this was a close call, as the long-term trend suggests inexorable slowdown. 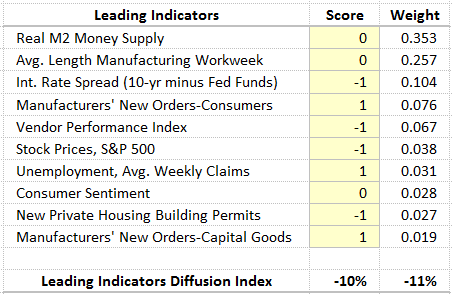 All 10 Leading Indicators are shown in the table below. The scores of -10% and -11% suggest that the economy will find it difficult to extend the meager progress seen in late 2011. Conclusion: The Lagging indicator score of +14% corroborates that the US economy was experiencing painfully slow growth during most of 2011. 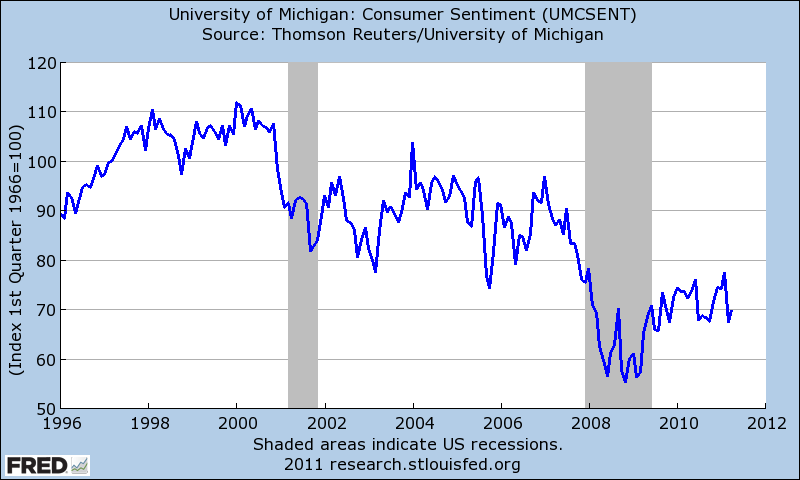 The Coincident indicator score of +25% suggests improving business conditions and accelerating growth late in 2011. The Leading indicator score of -10% suggests that the recent improvement in business conditions will not accelerate further, and the slow-growth environment will persist through the first half of 2012, at least. 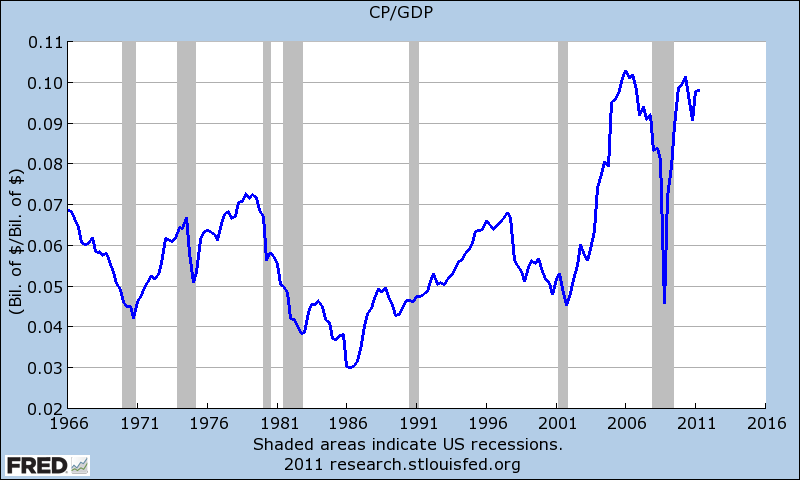 Ratio of Corporate Profits to GDP. I find it fascinating that the “normal” ratio of Corporate Profits to GDP seems to have doubled during the lost decade in stocks. The “corporatization” of the US has not been good for Main Street. Ratio of US Debt to GDP. By now, everyone is familiar with the Rogoff and Reinhart (2009) study showing that advanced economies with Debt/GDP ratios greater than 100% grow half as fast. The US is just about there, and borrowing more every time Congress is in session. 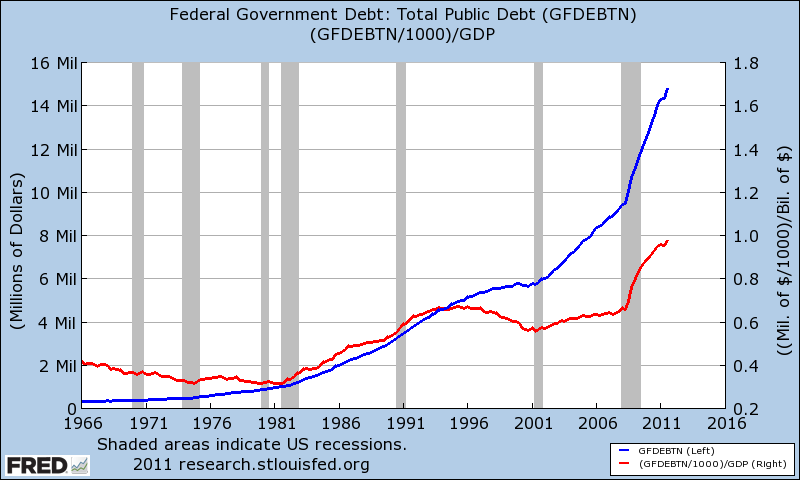 The trend in total Federal Government Debt is asymptotic, and clearly unsustainable. 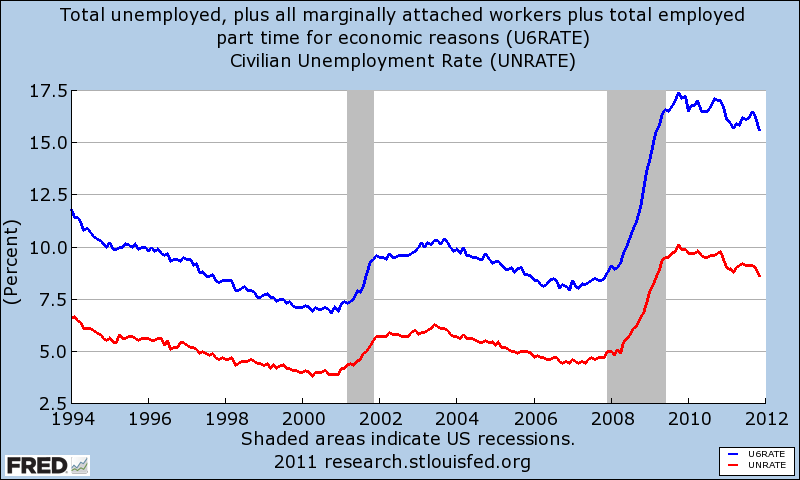 U6 Unemployment + Underemployment. The spread between the unemployed and underemployed expanded rapidly early in the current economic recovery. The manner in which unemployment is measured is outdated, and intended to impart a deliberate positive bias to the unemployment numbers. 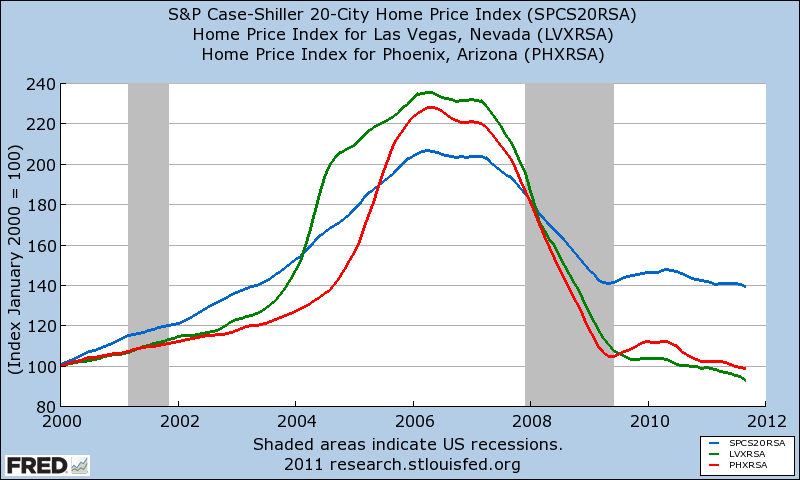 Case-Shiller Home Price Index. Yet another sharp downturn for the Case-Shiller Index. Markets experiencing extreme real estate bubbles, such as Las Vegas and Phoenix, continue plunging. 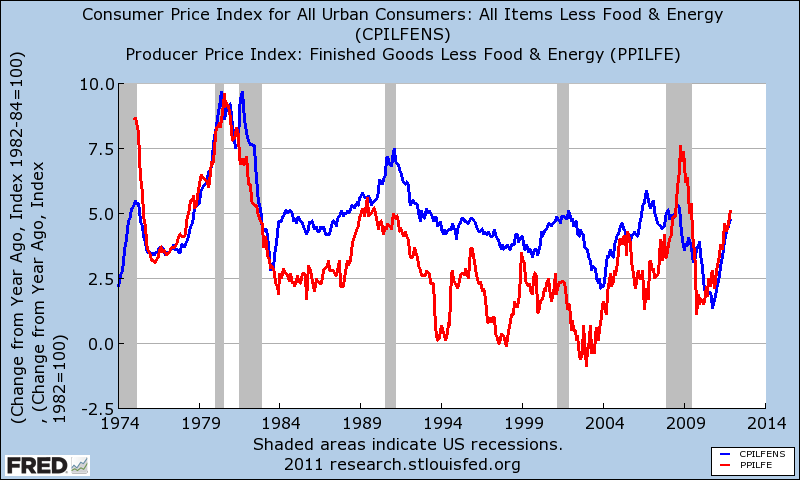 Core CPI and PPI. The bean-counters that calculate inflation have done everything in their power to report misleadingly low inflation statistics, but they seem to be running out of tricks. Core CPI and PPI continue spiking to 1980s-type levels. Real Oil and Gas Prices. 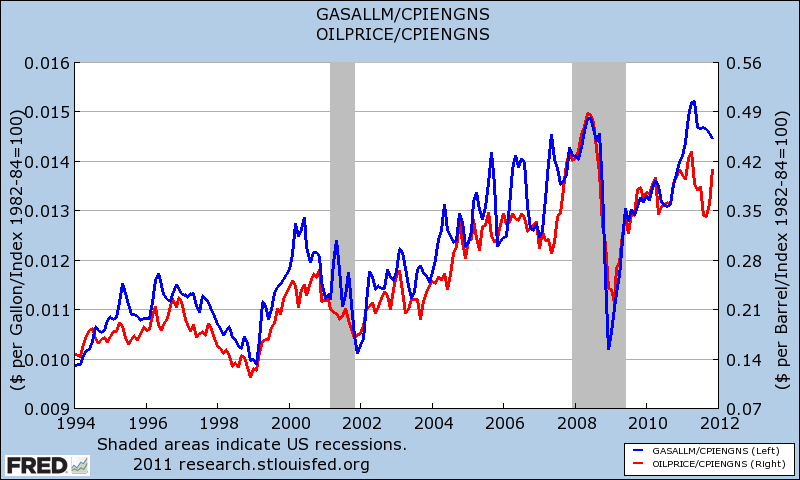 Oil and Gas prices have been rising faster than the Energy CPI for decades. This functions as a tax on the US Consumer (collected by large, integrated energy companies). From 2009 through early 2011, commodities prices soared at every sign of global economic strength, which neutralizes economic growth in consumer- and automobile-oriented economies like the US.